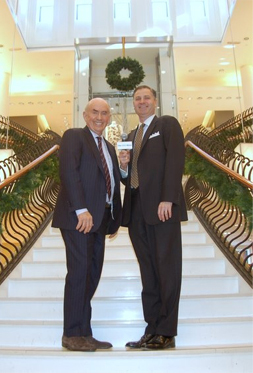 Jack Mitchell and family own the most successful independent retail stores in the country. How? He fosters a culture of niceness with his customers and his employees. His books, Hug Your Customersand Hug Your People, blueprint his family’s success. He’s on Getting Your Money’s Worth with Judith West. Wayne Turmel talks to legendary retailer Jack Mitchell about his new book, Hug Your People. How do you keep employees engaged and wanting to come to work? How do you manage through tough times? Also we look at a Cherokee woman with a cool job title. Stephanie Weaver interviews Jack Mitchell, author of Hug Your Customers, for the Experienceology podcast. What’s more important, your internal customers (employees) or your external customers? Jack Mitchell talks with Jim Blasingame and provides the answer: both. Jack talks about the proper care and feeding of both of our customer groups. Jack's first book Hug Your Customers, showed just how powerful it is to make a human connection to your customers. Now he explains how to create a culture in your company that will attract and inspire those you work with to love to come to work in the morning. Do you say you trust your employees but hire secret shoppers to check up on them? Do you say you value their input but use a suggestion box? This book gives the blueprint and also the real muscle behind it all – appreciation. The man who taught us how to “hug” our customers, Jack Mitchell is now ready to teach us how to “hug” our people. He and Jim Blasingame talk about the keys to success with employees. Are customers the center of your world? Of course we say they are, but are they treated that way? Jack wants you to treat them like kings and queens. Impress them by remembering their nicknames, favorite sports team and anniversary. Have their favorite beverage on hand when they stop by. Create a culture that appreciates and personally interacts with your customers. It not only creates a place that's fun to work, but it creates loyal customers that come back time and again. I don't know a business owner who wouldn't say the customer is the most important part of their business, so I asked Jack how he would know if an owner or CEO really believes that or is just kidding themselves. See if you pass the test.